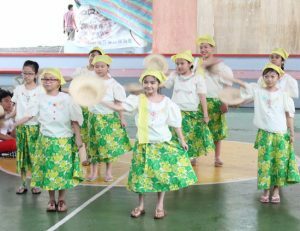 31 August 2018 – Filipino, Araling Panlipunan, MAPEH and Livelihood Education subject areas united anew for this school year’s celebration of Buwan ng Wika with the theme – “Filipino: Wika ng Saliksik”. 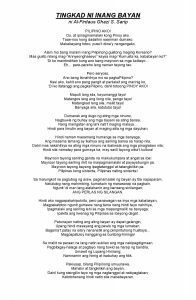 The celebration kicked off with a reflection from Al-Firdaus Ghazi S Sarip, a Grade 11 student from GAS strand with the title – “Tingkad ni Inang Bayan”. The full text of the reflection is posted after the article. The different grade levels were grouped into three groups: Grades 1 – 4, Grades 5 – 8, and Grades 9 – 12. After the reflection, the groups proceeded to the location of their first activity. 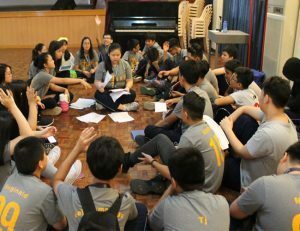 MAPEH activities were done in the school quadrangle, AP and LE activities were done in the Little Theatre, and Filipino activities were stationed at the auditorium. Each subject area allotted two (2) hours for each group to finish the activities prepared. Grades 1 – 4 and Grade 9 during their Filipino activity. 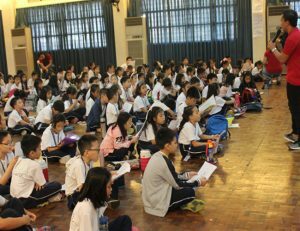 At the auditorium, Grades 1 – 4 were taught to sing Filipino folk songs like Paruparong Bukid, Leron-leron Sinta, Sitsiritsit and Magtanim ay ‘Di Biro for one and a half (1 ½) hours. Each level presented their chosen folk song in front of their group mates and teachers. 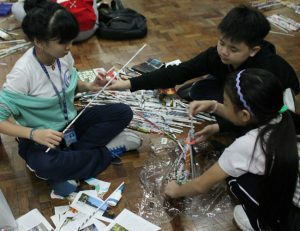 Grades 5 – 8 created posters and slogans for the theme – “Wikang Filipino: Wika ng Pagkakaisa at Karunungan Tungo sa Maunlad na Bayan”. Each postlogan was presented to their group mates through the Ipad which is projected live on the screen. The activity for Grades 9 – 12 was to come up with a medley of five OPM (Original Pilipino Music) songs. 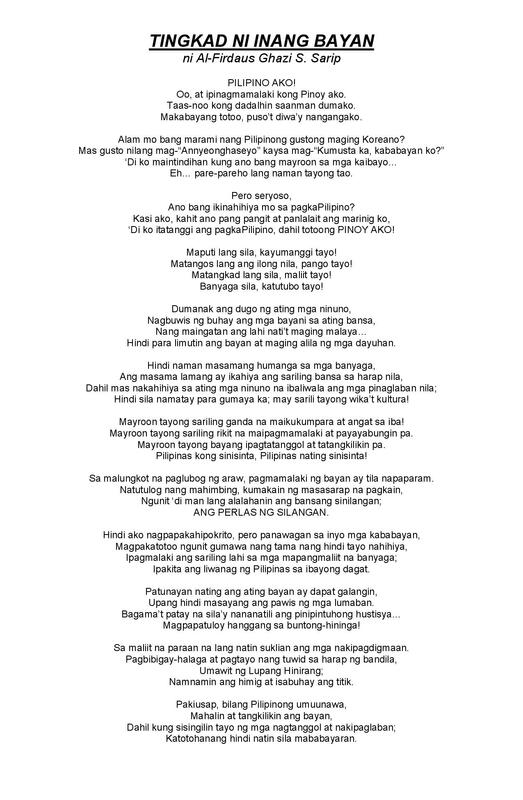 Most of the songs chosen for the medley were songs popularized by OPM bands and Filipino pop artists. The Bahay-kubo diorama exhibited after the activity and Grades 5 – 8 during their AP and LE activity. 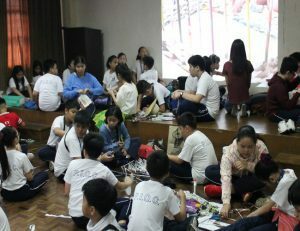 At the Little Theatre, Grades 1 – 2 students filled a picture of a Filipino landscape with pieces of paper cut from magazines while Grades 3 – 4 created a mural that shows the Filipinos’ urban life. Each output was posted in the bulletin board. Grades 5 – 8 created sturdy native bags woven from old newspapers. It is a very humble bag with handles that can fit snugly in the hands. 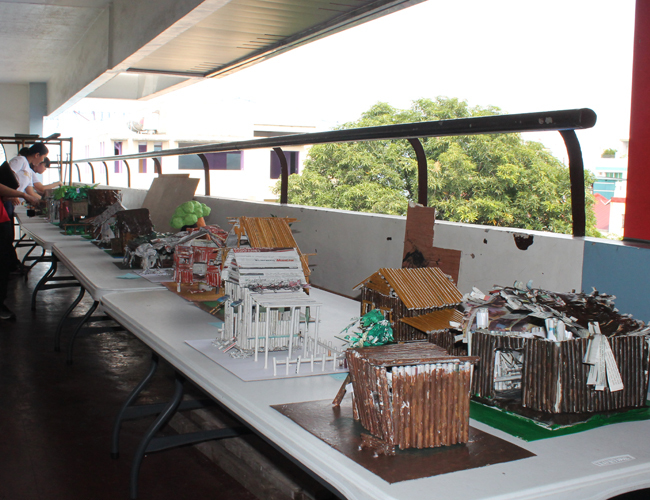 Grades 9 – 12 created a Bahay-Kubo diorama made of rolled newspaper sheets. 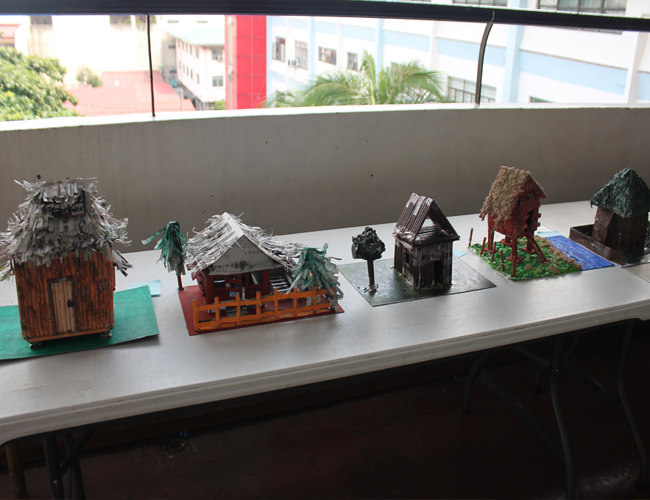 These bahay-kubo dioramas were exhibited at the corridor after the activity for the lower grade levels to look at. PIQC’s Philippine Folk Dance club during their presentation in MAPEH activities. At the quadrangle, Grades 1 – 4 had fun playing quiz bee, pictionary and Pinoy Henyo (Filipino charades). The questions asked were mostly trivia about the Filipino culture. The singing skills of Grades 5 – 8 were tested in singing a Filipino folk song in the tune of a popular OPM song. They presented their final output after one (1) and a half (1/2) hours of practice. 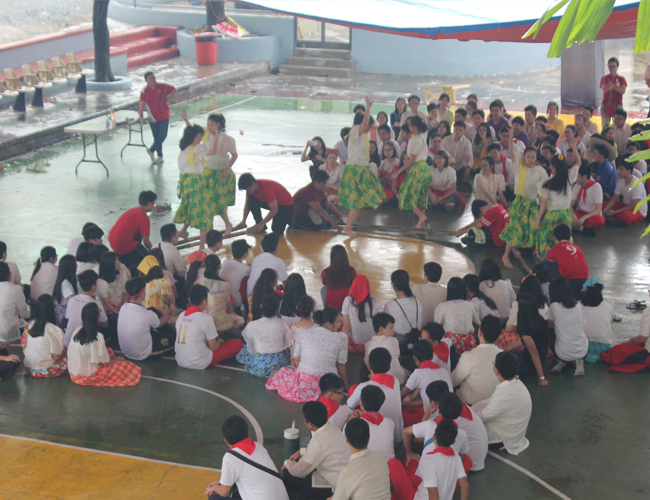 PIQC’s very own Philippine Folk Dance club presented Grades 9 – 12’s activity which was to dance famous Filipino folk dances while wearing their Filipiñana costumes. In support of the activity, canteen concessionaires sold Filipino delicacies through out the day. It was a full day of celebrating the Filipino language and culture.